While they were eating, Jesus took bread, said the blessing, broke it, and giving it to his disciples said, “Take and eat; this is my body.” Then he took a cup, gave thanks, and gave it to them, saying, “Drink from it, all of you, for this is my blood of the covenant, which will be shed on behalf of many for the forgiveness of sins.” (Matthew 26-28). The Eucharist is celebrated on Monday – Saturday at 10.00 am. Mass of the Sunday is celebrated on Saturday evening at 6.00pm (Vigil), Sunday morning at 10.00 am, 11.15 am and 12.30 pm. There is an extra Mass at 7.30 am from Monday to Friday during Lent. Normally First Holy Communion is arranged through the local schools. We will begin the period of preparation for your children’s First Holy Communion and First Confession with a special Enrolment Ceremony in each parish. Certificates will be distributed through the schools and during the Enrolment Ceremony the children will be invited to present their certificates, which will indicate that they intend to prepare well for First Holy Communion, with the help of their parents, teachers and priests. We also invite you to bring your child’s Baptismal candle (or a similar one) which will be used during the Ceremony. NB: If you are living in Clontarf, you may attend the Enrolment Ceremony in your own parish or in the parish where you attend Mass. 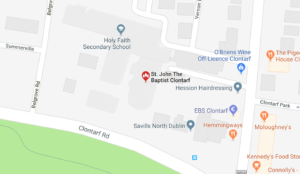 If you are living outside our three Clontarf parishes, you are welcome to enrol your child at any of the Masses in the Clontarf parishes. It would be lovely if as many of your family as possible could attend this special Mass for your children. We look forward to seeing you all there.